Ascension Now examines the New Testament references to the ascension and exhaltation of Jesus and looks at the theological and liturgical implications. This includes not only the description of the "event" in the Gospel of Luke and the Acts of the Apostles but also the departure scene that concludes the Gospel of Matthew and the references to Christ as King, as Intercessor, and as "exalted in glory" elsewhere in the New Testament. 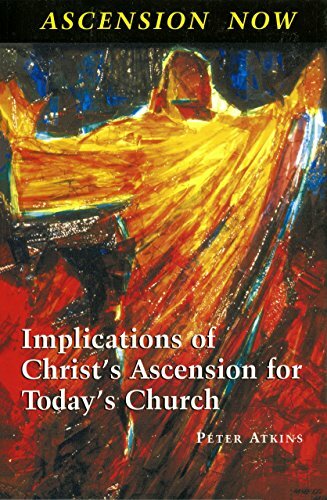 It also notes the implications for Christians who pray and preach and foreshadows some developments in worship and practical living in the light of the ascension experience. The doctrine of the ascension of Christ is important to theological debates and to the liturgical developments of the Christian Churches. Unless we connect the Christ of history with the Christ of worship, we will fail to hold together the two essential poles of the Christian faith. Christ must be both in time and beyond time. He must have been in history and been more than just a historical figure. He must be both fully human and fully God. Only then can Christ be the object of our faith and our worship. The ascension of Jesus can be seen as the journey of the humanity of Christ into the heart of the Divine God and of our journey in worship into the divine dimension of heaven. In Ascension Now, Bishop Atkins shows that in our worship we are never earthbound; we lift our hearts and minds up to where Christ is seated, symbolically reigning over the world. There he holds them tenderly in love as, through his redemptive power, we are transformed and renewed to fulfill the purposes of its Creator God. Chapters are "Introduction: The Importance of the Doctrine of the Ascension for Today's Church," "Prelude: New Ways of Seeing the Ascension," "The Biblical Evidence for the Doctrine of the Ascension," "The Theological Implications of the Doctrine of the Ascension," "The Liturgical Implications of the Doctrine of the Ascension," "The Implications of the Ascension for Our Personal Prayers," "The Implications of the Doctrine of the Ascension for Preaching," "The Implications of the Doctrine of the Ascension for Future Liturgical Practice," "Conclusion: Personal Implications of the Doctrine of the Ascension," and "Appendix: The Geography of the Ascension." Bishop Peter Atkins is the retired Anglican bishop of the Diocese of Waiapu in New Zealand.